Welcome to the "Hello Pumpkin" blog hop, if you arrived here from Doreen's blog you are in the right place. If you arrived here by chance you can continue the hop by clicking on the link at the end of this post. 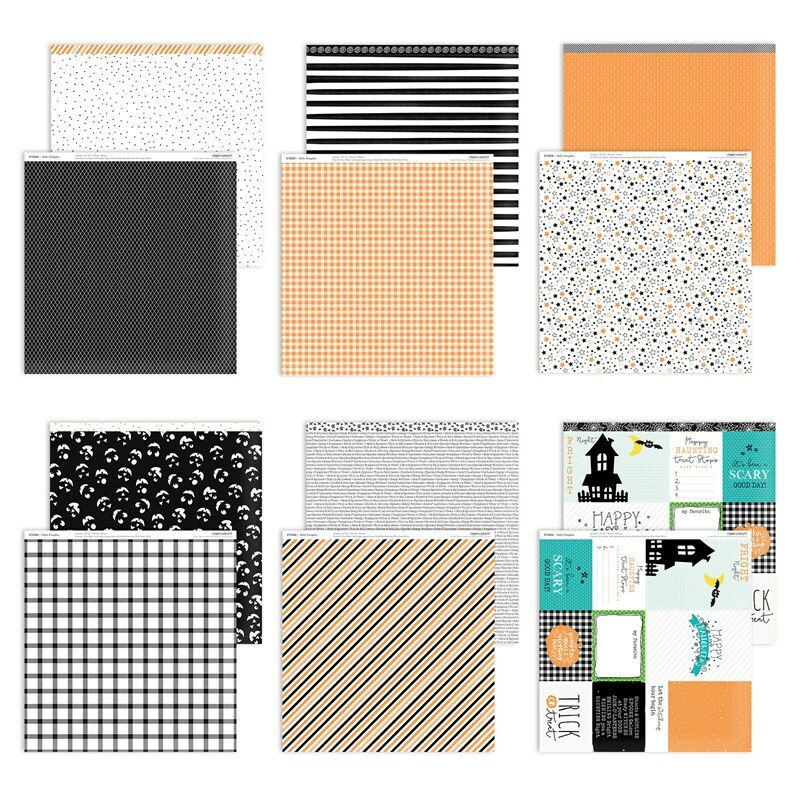 The Hello Pumpkin paper pack is mostly designed for celebrating Halloween but as always the papers are so lovely and can be used for other different projects. The dominant black and orange colours can be quite beautiful when paired together. Lagoon can also be used with these colours as you can see it was featured in the PML cards. I have made three different cards, this first one uses the Bunches of Love stamp D1815 but I only used the outline stamp with black ink then coloured the image with the Shin Han markers to match the papers. I stamped the image directly onto the black dot paper, then mounted it on black carstock and then the orange gingham paper. A little bling and ribbon never goes astray. I don't celebrate Halloween but still wanted to show that you can use this collection with a Halloween theme but it still not be Halloween. I found a pattern for a coffin shape on the net to make this card. You can find the pattern here once I printed the shape on regular copy paper I then cut it out with the left side on the fold of black cardstock. The skeleton, the "no bones about it" and "it's your birthday"sentiment are from old stamp sets which are now discontinued, but I am sure you can find something similar. After stamping the skeleton and fussy cutting it I place on the star paper but it seemed to blend in the with the white background of the paper. So I adhered it to black cardstock and again fussy cut around it which then grounded the image. I am quite happy with how this one turned out, I have the perfect young man to send this to as his birthday is coming up soon. Who wouldn't want to receive a birthday card with a dancing skeleton on it? The finished card is 5 1/2" x 3 1/4" and fits easily in our standard envelopes. This third card is a simple and easy one, the butterfly was cut sing the Artistry Cricut cartridge, you can find the image on page 42. Once I adhered the butterfly to a different orange pattern paper I cut around it with my scissors. The black and white stripe paper and the same orange pattern paper was also used. Some bitty sparkles, black gems and a sentiment and the card is finished. To continue the hop click here to go to Megan's Crop Craft Create blog, I am sure she will have something wonderful to share. Thanks again for stopping by and I hope you found some inspiration. Please take a moment and leave a comment, they are very much appreciated. Three stunning cards Doris. You have such an eye for design. I love the way you've used the Nectarine with black and white. That skeleton card is a crack up. Love your cards, Doris. The butterfly one is my favourite! I love the Get Well card the most. I love the colouring and light orange colour with it. Wow so many amazing & different creations they all look amasing but the get well card keeps drawing me back. I love how you stamped onto the patterned paper and that butterfly card is beautiful!